Besides scanning, contacts can also be added to Sansan by importing a CSV file.The following shows the steps for this method. If you wish to import data into Sansan from Excel or another system, prepare a CSV file using the function described here. Administrator permissions are required to perform this function. Importing data in this manner is not subject to any fee. Imported data may not be immediately displayed.An email notification will be sent to the implementing user's email address when the processing is complete. Data for up to 10,000 contacts can be imported in one file (up to 10,000 rows in a CSV file). Business card images cannot be imported in this manner. Only files in the correct format can be imported. Watch for these issues and these common problems when importing. 1. 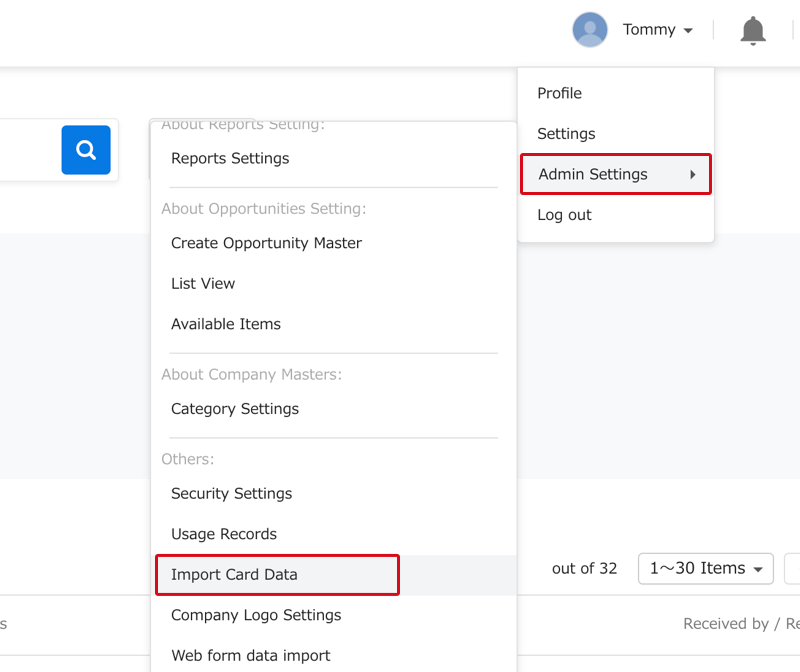 In the top right of your screen click on your name -> Admin Settings -> Import Card Data. 2. On the Import Card Data screen, click on Download Format.A specially formatted CSV file will be downloaded. 3. From row 2 downward, enter and save the necessary information.Leave row 1 as is. For rules on entering data, click here. 4. From the Import Card Data screen, click the Select File button and select the file you created in step 3. The file name will then display. 5. Click on "Check".If an error occurs, download the file and then view and correct the error(s), and save the file. When the errors have been corrected, again choose the file and check. If there are no errors, you will see Ready to Import and can continue to the next step. 6. 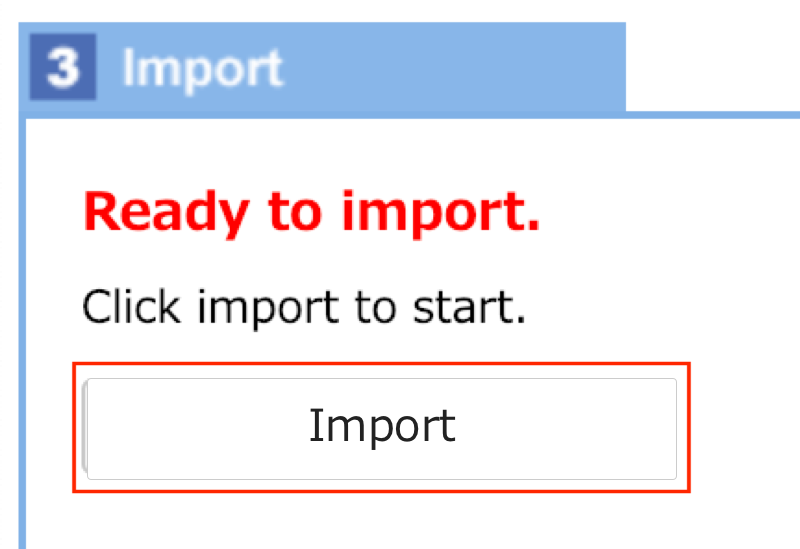 Click on "Import". A popup will show the status of the import processing. The status after importing is [Waiting for process to start]. The estimated time to complete import is 30minutes per 1,000 items. You will be notified by email as soon as import is complete. After import is confirmed, status will change according to the processed stage. Waiting for Process to Start After the import is confirmed, this is the status before the actual import process starts. Depending on the server, this status may continue for a while. Importing This is the status of the actual data import. The amount of time required for the import process to begin will vary according to the amount of data you are trying to process and the data processing situation of other users. Import Complete Import has completed. An email will be sent to the users who performed the business card data import function to notify them that the process has been completed. There are Errors. When import completed, this shows there are data that failed to import due to errors. Information such as the number of failed import data will be sent in the completion notification Email. Error data can be downloaded from the ""error data"" list. The first line will be used as item name. Please enter data starting from the second line. Card Holder User ID ○ Alphabets, Numbers, Symbols - This is the user ID for Sansan. Specify which user the imported data will belong to. Exchanged Date Numbers, Some Symbols (/-) - This is the date cards were exchanged. Tags - Max. 50 characters Specify Tag to be attached to imported card. To attach multiple tags, separate tag names by semi-colon. Company Name ○ - Max. 250 characters Specify company name. If company name is left blank, "(None)" will be imported as company. Company Name (English) Alphabets, Numbers, Symbols Max. 250 characters Use when the company name can be read in English. Company Name (Kana) Kana, Alphabets, Numbers, Some Symbols (・ － - ') Max. 250 characters Search Kana, use in sort function of list view. Entry is recommended for your convenience. Department Name - Max. 250 characters Specify department name. Title - Max. 250 characters Specify title. Name [Last] ○ - Max. 250 characters Specify last name of individual. If last name is blank, "(None)" will be imported as last name. Name [First] - Max. 250 characters Specify first name of individual. Name (Kana) [Last] Kana, Alphabets, Numbers, Some Symbols (・ － - ') Max. 250 characters Specify Kana for last name. Search Kana, use in sort function of list view. Name (Kana) [First] Kana, Alphabets, Numbers, Some Symbols (・ － - ') Max. 250 characters Specify Kana for first name. Zip Code(1) Numbers, Some Symbols (-) Max. 7 characters, not including hyphens. Specify Zip Code. These will be registered without hyphens. Address(1) [All] - Max. 1,000 characters Specify address. Address will be automatically separated and saved in 3 parts: 1)Prefecture 2) City 3) Town/Number/Building. * Foreign addresses will not be automatically separated. TEL-1(1) Numbers, Some Symbols (+-().) Max. 30 characters Specify phone number. Symbols such as parentheses and periods will be automatically converted to hyphens and saved. * Words such as (Main) and (Extension) will not be saved. * Hyphens and periods can be registered except at the beginning or the end of an entry. * Parentheses can only be registered if they are used in pairs. * Plus marks (+) can only be registered at the beginning of entries. TEL-2(1) Numbers, Some Symbols (+-().) Max. 30 characters Specify phone number. FAX(1) Numbers, Some Symbols (+-().) Max. 30 characters Specify FAX number. Mobile(1) Numbers, Some Symbols (+-().) Max. 30 characters Specify mobile number. Email(1) Alphabets, Numbers, Symbols Max. 250 characters Specify Email address. URL(1) Alphabets, Numbers, Symbols Max. 250 characters Specify URL. Only URLs starting in http://, https:// or ftp:// can be registered. Zip Code(2) Numbers, Some Symbols (-) Max. 7 characters, not including hyphens. Specify Zip Code. Address(2) [All] - Max. 1000 characters Specify address. TEL-1(2) Numbers, Some Symbols (+-().) Max. 30 characters Specify phone number. TEL-2(2) Numbers, Some Symbols (+-().) Max. 30 characters Specify phone number. FAX(2) Numbers, Some Symbols (+-().) Max. 30 characters Specify FAX number. Mobile(2) Numbers, Some Symbols (+-().) Max. 30 characters Specify mobile number. Email(2) Alphabets, Numbers, Symbols Max. 250 characters Specify Email address. URL(2) Alphabets, Numbers, Symbols Max. 250 characters Specify URL. Memo - Max. 2,000 characters Insert memo.